It happens in all markets. A few years ago, adults took up painting, re-living their childhood with the mandala trend. As a result, coloured pencil companies faced a skyrocketing increase in production that they hadn’t expected. In audio-visual translation, catch up TV was our own mandala. New audio-visual content is created every day, in response to viewer demands. Most (but not all) of this content is consumed by the spectator thanks to dubbing or subtitling. 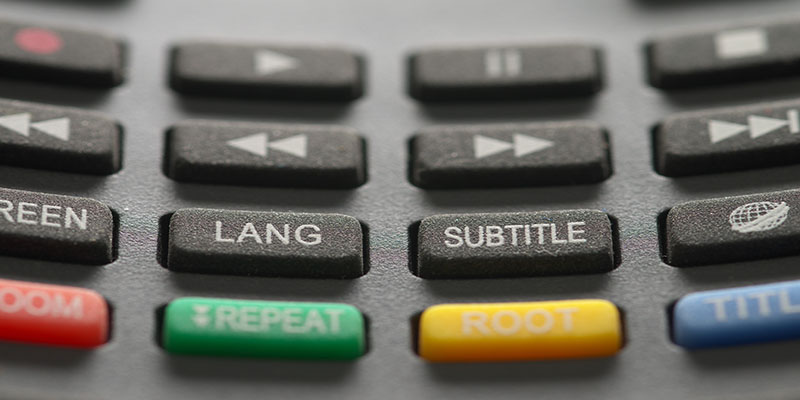 Subtitling is an audio-visual translation technique that permits the understanding of an oral text, in its original version, by providing the viewer with a written translation. Thus, the translation appears on the screen along with the film and the original sound. It is, therefore, a technique subordinated to certain characteristics, and accordingly, has to fit its own standards. Whenever possible, subtitles should be centred on the lower side of the screen. They are to contain up to two lines with no more than 70 characters (35 each, including spaces). The subtitles remain on screen for a fixed time. This time should never exceed 6 seconds, or be less than 1 second, taking into account the text density. Finally, the text must appear simultaneously with the audio. To do so, the subtitles must be spotted, so that they appear and disappear in the most natural way. Above all, the text must respect the general rules of language. The subordination that we mentioned above can’t result in a schematic content that violates linguistic accuracy. Furthermore, when subtitling, we must pay attention to the use of italics (voice-over, songs, devices), capital letters (posters, titles, written text appearing on the screen), the dash for dialogue and many other conventions. Today’s viewer demands more and more catch up TV content, and broadcast channels have responded by adding fuel to the fire. This translates into a huge workload for subtitling professionals, but also into shorter deadlines. Subcontracting is very frequent, so there is a large chain of intermediaries between the translator and the channel. Not long ago, HBO used the subtitles of an amateur translator who uploaded his work into a pirate website. The channel even showed the nickname of the translator at the end of the episode. This serious mistake was probably the result of the previously mentioned chain of intermediaries. They might have tried to save time given the excessively short deadlines, or perhaps they just wanted to make a bigger profit. Truth is, often it remains necessary to convince people that professional translators are always needed, even in this field. Subtitling is not only relegated to the digital contents of television, or to the independent cinema films that we only agree to go to impress our love interests. Audio-visual content produced with marketing purposes is quite common nowadays. For example, corporate promotional videos filmed in a specific language and then provided with subtitles, so that more clients have access to the content therein. Clearly, it is extremely important to ensure that these services are provided by a professional. It is a great idea to create a promotional video for your company, where you can address your clients and present your services. It is also a great idea to translate its content and include subtitles. But it would be an awful idea to ask your brother-in-law Mike to do this, just because he spent last summer in Mallorca and knows a lot about computers. Obviously, you won’t get the best quality by sparing costs. If you present your company to potential customers with a poor content, this will hurt your image, instead of intensifying it. Therefore, as in any field of translation, it is essential to rely on a qualified professional. Graduate degree in Translation and Interpretation from Universidade de Vigo (2013). Translator and proofreader in the German and English to Spanish combinations.